In June 2006 the seasonally adjusted current account of the euro area recorded a surplus of EUR 4.0 billion, as a result of surpluses in goods, services and income. In the financial account, combined direct and portfolio investment recorded net inflows of EUR 63 billion, mainly reflecting net purchases of euro area equity securities by non-residents. The seasonally adjusted current account of the euro area recorded a surplus of EUR 4.0 billion in June 2006 (corresponding to a surplus of EUR 5.5 billion in non-seasonally adjusted terms). This reflected surpluses in goods (EUR 2.5 billion), services (EUR 2.3 billion) and income (EUR 2.2 billion) that were partly offset by a deficit in current transfers (EUR 3.0 billion). 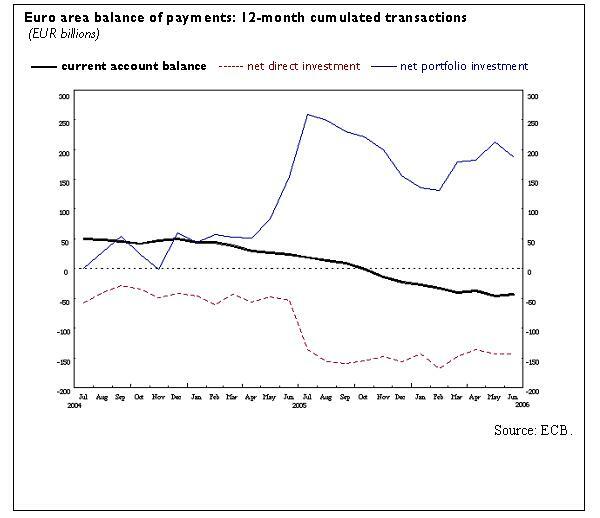 The 12-month cumulated current account to June 2006 recorded a deficit of EUR 44.1 billion, i.e. around 0.5% of GDP, compared with a surplus of EUR 26.4 billion a year earlier. This shift mainly resulted from a decline in the goods surplus, by EUR 56.0 billion, because imports rose faster than exports. The deficits in income and current transfers also increased over the same period, partially offset by an increase in the surplus for services. In the financial account, combined direct and portfolio investment recorded net inflows of EUR 63 billion in June 2006, reflecting net inflows in portfolio investment (EUR 71 billion) and net outflows in direct investment (EUR 9 billion). Within direct investment, net outflows of EUR 6 billion in equity capital and reinvested earnings added to net outflows of EUR 3 billion in other capital (mostly inter-company loans). Within portfolio investment, net inflows were recorded in both equity (EUR 66 billion) and debt instruments (EUR 6 billion). The net inflows in equity were accounted for by the net purchases of euro area securities by non-euro area residents. The net inflows in debt instruments were due to net purchases of euro area bonds and notes by non-residents, which were partly offset by their net sales of euro area money market instruments. Other investment recorded net outflows of EUR 51 billion, predominantly resulting from net outflows from the MFI sector. Reserve assets decreased by EUR 1 billion (excluding valuation effects). The stock of the Eurosystem’s reserve assets stood at EUR 323.8 billion at the end of June 2006. In the 12-month period to June 2006, combined direct and portfolio investment showed cumulated net inflows of EUR 44 billion, compared with net inflows of EUR 102 billion a year earlier. This development resulted from rising net outflows in direct investment (increasing from EUR 53 billion to EUR 143 billion) that were only partly counterbalanced by higher net inflows in portfolio investment (increasing from EUR 155 billion to EUR 187 billion). While net outflows in direct investment mainly increased on account of higher investment abroad by euro area residents, the increase in net inflows in portfolio investment mainly reflected a doubling of the net purchases of euro area equities by non-residents. In addition to the balance of payments for June 2006, this press release incorporates revisions for May 2006. These revisions have not significantly altered the previously published statistics. A complete set of updated euro area balance of payments and international investment position statistics is available on the ECB’s website in the “Statistics” section under the heading “Data services”/“Latest monetary, financial markets and balance of payments statistics”. The results up to June 2006 will also be published in the September 2006 issue of the ECB’s Monthly Bulletin. A detailed methodological note is available on the ECB’s website. The next press release on the euro area monthly balance of payments will be published on 21 September 2006. Table 1: Current account of the euro area – seasonally adjusted data. Table 2: Monthly balance of payments of the euro area – non-seasonally adjusted data.